Before getting to the outrageous anti-Israel resolution at the UN let us just bear in mind that the UN does not operate to bring peace to the world or even to conflicts limited in scope unless major powers see peace as an interest. And that includes peace in small, individual, limited conflicts. 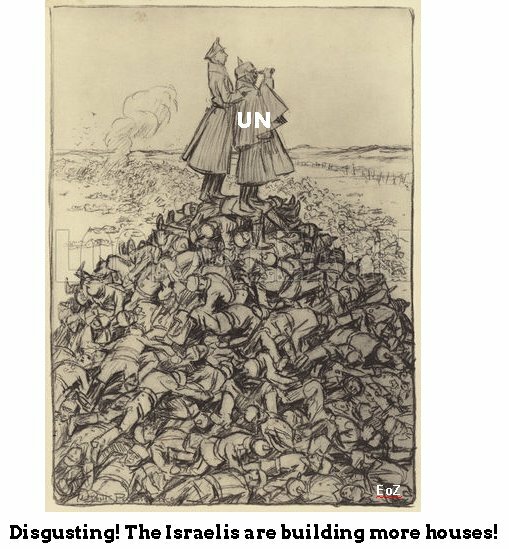 This is so whatever the intentions of the UN's founders may have been. The US State Department was hostile to the very idea of a Jewish state even before Israel's independence. But since the Six Day War this traditional State Dept policy has been complemented by a narrative that portrays Arabs as perpetually oppressed and persecuted by Israeli Jews. In fact, history says the opposite. Since the rise of Islam, Jews and Christians in Islam-ruled countries have been subject to an inferior status which eventually was named the dhimma and Jews and Christians in the Islamic domain have been named dhimmis who suffered all sorts of legal disabilities and inferiorities. Later a version of dhimmi status was extended to populations in south and east Asia who were neither Jews nor Christians. Of course, in Christian lands too Jews suffered all sorts of legal disabilities and inferiorities. What we face now is a further legal-like denial of Jewish human rights. Our rights are denied on so-called "legal" grounds. At one time, the so-called "Left" defended people and their rights against cold, inhuman Law that ignored the realities of concrete situations and defended people against oppression by the unfeeling Law. Yet today no one would expect any self-proclaimed "leftist" to defend Jews against the depredations of the Law, often seen by "leftists" in the past as a mere instrument of capitalist, imperialist oppression. Today of course Jewish human and civil rights are denied in the name of Law, in this case International Law. The interpretations made of Law are false of course. And Geneva IV:49:6 does not forbid Jews from moving into the Judea-Samaria area, the so-called West Bank, territory recognized by the international community as the Jewish National Home by the San Remo Conference, 1920, and by the League of Nations, 1922. This status was confirmed in the UN Charter Article 80, when the charter was adopted in 1945. So Law is being used as a bludgeon against the Jews and their rights. And it is a false interpretation of law at that. But the hatred of Jews endemic in the State Department and in the Obama White House is palpable and cannot be quenched by a reasonable study of the relevant international law or its honest interpretation. Obama has shown himself to be the enemy that we knew he was back in 2008 when he ran in the presidential primaries. He colluded with the four Security Council member states that promoted the evil resolution. He wanted it, and according to an account on Israel TV by Oded Granot, US and Palestinian Arab representatives were discussing this step as far back as March of this year. Jews in the Diaspora need to worry about this resolution too because if the rights of Jews to reside in the ancestral homeland of the Jews can be denied --a right guaranteed by international law in the Jewish National Home principle as well as in the League of Nations Mandate-- then their rights of residency and other rights can be denied in the countries where they live, including in the United States.